Twin Touch is a touchscreen from Rafi that not only detects capacitive touch inputs but also the pressure exerted on the panel. This feature reduces false inputs through external forces, it increases operating reliability and allows the implementation of additional input levels. Pressure thresholds for input recognition can be set via software. The new Flexscape input devices for integration into touchscreens also opens up new possibilities: the Flexscape One pushbutton is activated by touch, but is only switched when a certain pressure threshold is exceeded. Tactile feedback to confirm switching enables safe operation. 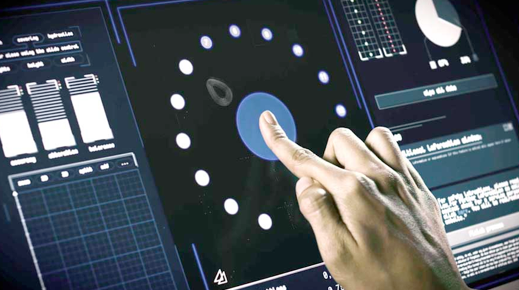 A low-cost alternative to milled contours in the touchscreen, the Flexscape Wheel is a finger guide that comes as a sticker, which can simply be attached to the glass surface.